Attendees of Pioneer Theatre Co. productions are accustomed to high-quality professional theater. They're less accustomed, however, to seeing a show starring a member of its original Broadway cast. 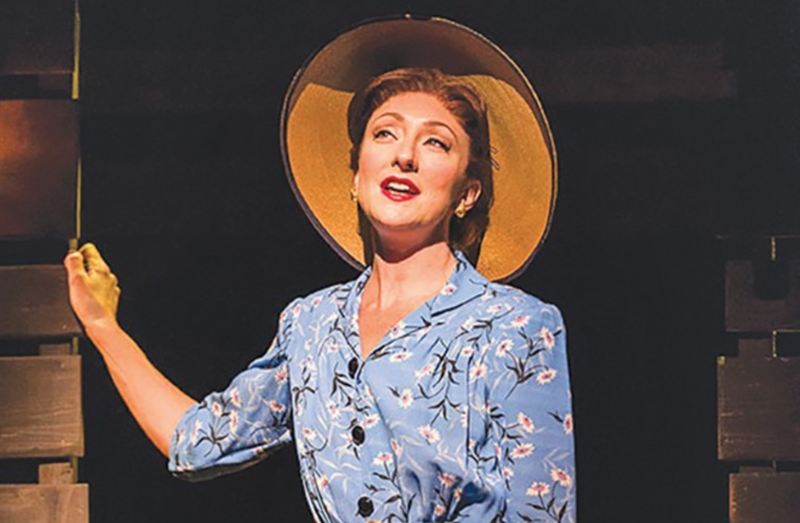 Bright Star—a musical created by Steve Martin and Edie Brickell—comes to PTC as part of a national tour, including Carmen Cusack in her Tony Award-nominated lead role of journalist Alice Murphy. The story moves between two time periods: 1946, as Alice works at a North Carolina newspaper with an aspiring writer; and 1923, when a young love affair changes Alice's life. Actor Jeff Austin—who plays the villainous mayor Josiah Dobbs, and comes from the Los Angeles and San Francisco productions of the show—finds the Americana music style employed by Martin and Brickell ideal not just for its setting, but to capture the audience's energy. "The end of first act is less than uplifting, really jarring to the audience," Austin says. "Part of the brilliance of the show is to start [the second act] with loud, raucous hootenanny music, and they get the audience back in the palm of the show's hand." McHale has become something of a jack-of-all-trades when it comes to entertainment, from creating cartoon voices for Bojack Horseman and Rick and Morty, to leading hilarious live-action comedy series like The Great Indoors and Community, and even appearing in the recent revival of the legendary sci-fi series The X-Files. Despite his many roles, many of us still remember McHale best as the host of E! 's The Soup, the late-night satirical show where he roasted reality television and sarcastically commented on pop culture for 12 seasons. There's not much this producer/writer/actor can't do, and that's what keeps drawing us to his biting personality and humor. McHale has always managed to balance respect and pushing the envelope in delivering humor to his viewers, thus crafting his own unique style of stand-up. Less than one year after releasing his memoir, Thanks For the Money, McHale is hitting the road, and Salt Lake City is his first stop of 2018. Even though his on-screen career has brought him to greater fame, he's still a stand-up comic at heart. "I feel like [stand-up] keeps me one day away from death's door, it's so exciting and exhilarating," McHale said in a 2017 interview with AXS. "It really keeps me young. ... Live performance truly is the purest art form." In 1978, in a little town called Dawson City in Canada's Yukon Territory, a construction crew unearthed a curious find on the site of what was once a recreation hall: hundreds of cans of nitrate film, containing silent features from the early 1900s. The highly combustible film stock had long since been discontinued, and the majority of all movies from this era lost to fire or degradation. Sealed beneath the Arctic permafrost, the "Dawson City find" marks one of the greatest treasure troves ever of a portion of cinema history once thought lost to time. Director Bill Morrison's documentary Dawson City: Frozen Time is in part the story of that discovery, showing scenes from movies that hadn't been seen for decades. Yet he also constructs a tale of Dawson City itself, a boom town born out of the 1898 Klondike Gold Rush, where some men died in the treacherous quest for riches and others—like a brothel owner named Friedrich Trump—built fortunes out of that quest. Employing archival photos and creative use of the movies discovered in Dawson City, Morrison marks more than 60 years in the history of both a piece of geography and the motion picture industry itself. "O Romeo, Romeo, wherefore art thou Romeo?" That simple question has become one of the most quoted lines in the English language. It originated, of course, with William Shakespeare's classic Romeo and Juliet, a tragic tale about two ill-fated lovers whose bond defied the arch animosity that divided their two feuding families. Even those who have never seen the play—or any of the many film adaptations, for that matter—likely know that phrase well. After all, it's been part of the premise for many a romantic tryst, most famously, Leonard Bernstein and Stephen Sondheim's modern adaption, West Side Story. Still, there's nothing quite like the original rendition, especially as presented by the Grassroots Shakespeare Co., a homegrown theater troupe that's taken its vibrant productions of the Bard's work from Utah to the U.K. for the better part of the past nine years. Staged with modern audiences in mind, Grassroots Shakespeare sets out to create an immersive, easily accessible experience that allows viewers to pivot from passive observers to active participants, while the actors involved react and respond accordingly. It's a collaborative effort of sorts, and while the full beauty of Shakespeare's storytelling remains intact, the opportunity to gain added appreciation finds its full potential.